Who doesn't love macaroni and cheese? It's a childhood favorite and an adult comfort food. 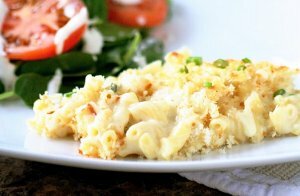 This free eCookbook, 11 Baked Macaroni and Cheese Recipes, featuring more than 10 easy macaroni and cheese recipes, contains a variety of easy mac and cheese recipes that you'll love. PLUS - you will also get the AllFreeCasseroleRecipes™ - The Casserole Connection newsletter for FREE! Did you ever think of mixing buffalo chicken with mac and cheese? 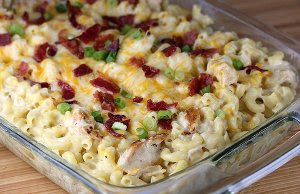 Thankfully someone did, because otherwise we wouldn't have this delectable Buffalo Chicken Mac and Cheese Casserole recipe (page 7). Other fine creations use pepperoni, ham, and bacon. Macaroni and cheese recipes for your man include "manly" ingredients, such as beer, chili, and chipotle chiles. And that's not all! You'll find a whole section that uses secret ingredients! This free eCookbook, 11 Baked Macaroni and Cheese Recipes, will surprise you with mac and cheese creations you have never thought of (but wish you had!). Make sure to download your free copy today and keep it handy for making macaroni and cheese recipes all year 'round. Not sure how to grab this book? For help downloading this eCookbook, check AllFreeCasseroleRecipes' guide on how to download eCookbooks. -- Mac and Cheese song is an finalist in the 2011 International Songwriting Competition (in the category of children's music). Written and animated by David Rees. Vocals by Patrick Morgan. Create a separate Facebook account without your personal info, to sign up for Facebook freebies without sharing your info.